Wondering where Part I is? Well, there is no Part I. Part I was my failed attempt yesterday to get this post out to all of Maxon’s fans. I posted it on YouTube and I guess YouTube is a big time fan of Maxon because they must have viewed it pretty quickly. Any then quickly decided I violated a song copyright and turned off the sound of the video. And well in thinking about it, I can’t blame them. I mean, a Dad trying to put music to a few pictures of his four-week old son to share with grandma….the NERVE! Hitler, Osama Bin Laden, and then me in that order as the world’s three worst people. But I digress. 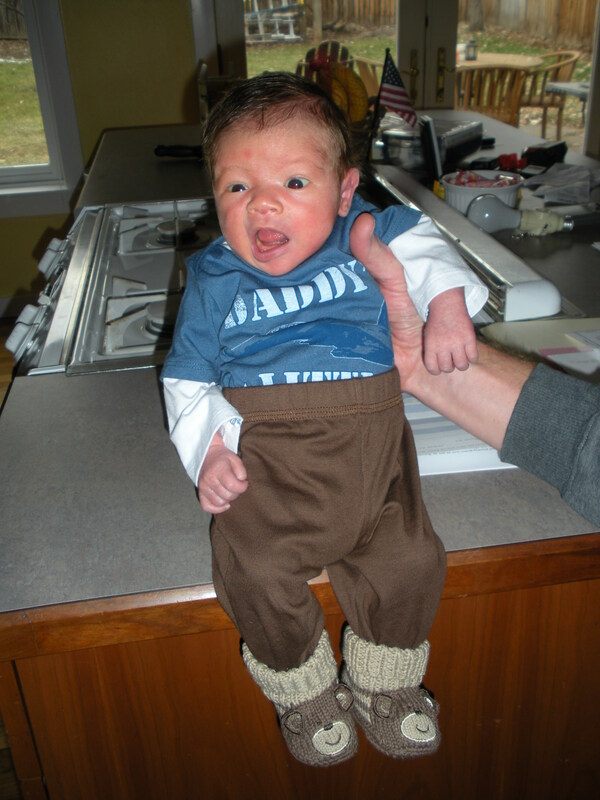 So, Maxon turned four weeks old Friday. He is now officially a big boy. Below is a video* of many of the images we have captured during that time. He is truly an interesting creature with a diversity of interests and emotions. *What you see below is not actually a video. It’s an image OF a video. However, if you click it, a video NOT located at YouTube will pop up and play. These are the kind of evil workarounds** villans like myself have to come up with. **You have to admit though, it’s kind of clever*** with the pic and all. ***Just don’t tell anyone because I didn’t really resolve the copyright problem, I just scooted around the problem so I still might be well on my way to prison/the chair. Typical wake-up stretch. Good message on the onesie to boot. 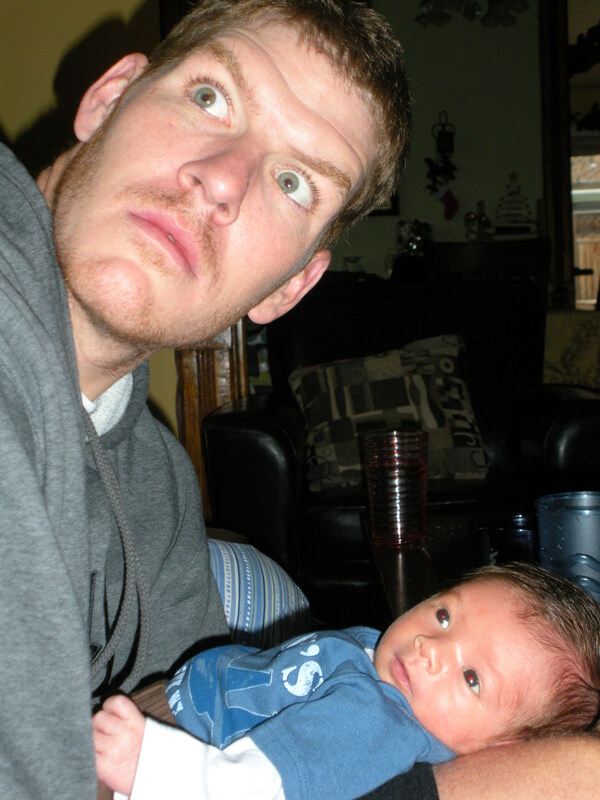 After the dust of becoming first time parents settled, I reflected on how the whole process played out. What stood out to me was not the miracle of life (although that is quite impressive in its own right), but the miracle of technology as a means to facilitate communication. The way we shared information about the birth of Maxon was abso-freaking-tootely NOT one bit like it was a generation ago. Below are my impressions of how things went down when a guy like me was born back in the 70s verses how when Maxon was born three weeks ago in the age of……The Internet. Back when a “pocket calculator” represented cutting edge technology…. Dad gets “the call” at work from the wife. He scrambles to get packed up and hurries home in the car. With no way to talk with her during his drive, he’s pretty panicked about how things are progressing. When it’s time to head for the hospital Dad tries to sneak in a call to the parents before they leave the house, but there isn’t much time for that. Being tethered to the wall in the kitchen to call both sets of parents is hard to do when you need to be packing up the car and tending to your wife. Perhaps Dad could locate a payphone at the hospital and call from there if the room didn’t have a phone in it. Once at the hospital, dad unpacks the camera bag and a half dozen or so rolls of film he bought (which wasn’t cheap) and begins some clumsy picturing taking. Sometimes he takes three shots of something when the first one was perfect and sometimes he takes only one shot of something when his thumb was on the lens or everyone was out of focus. Nearly a week after the baby was born, Dad heads to the drug store to drop off the film to be developed. Five days later he spends a large chunk of cash picking up the photos, not only because he developed so much film, but he’s also paying for five copies of every photo. Once he is home, Mom and Dad sort through the photos to find the small percentage of ones that will be good to share with family and friends. Then they write out individual letters to various people over the next few days, stuff the envelopes with the letter and pictures and then drop them in the mail. This was definitely no easy feat to accomplish while taking care of a newborn, but mom and dad are pretty efficient and are certainly better than most to already have the photos in the mail by the two week mark. A few days later, viola! 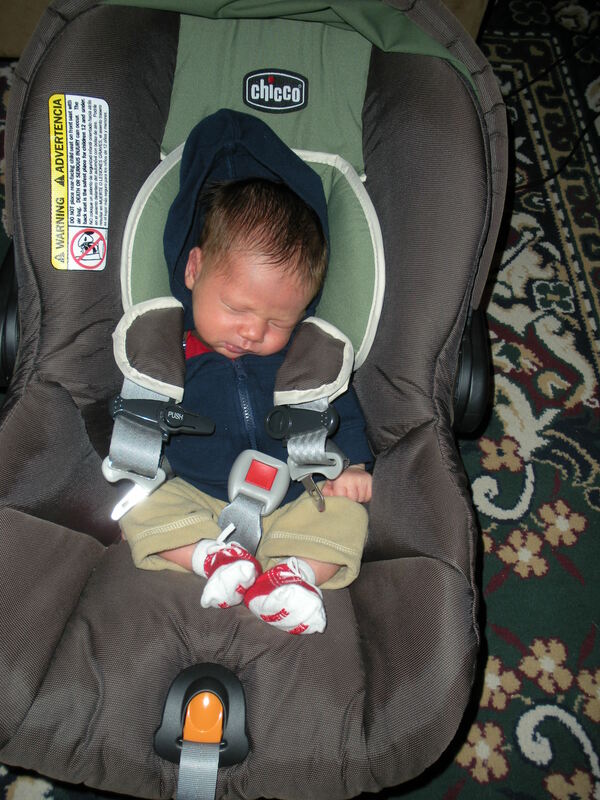 Grandma and grandpa finally get to see their new grandbaby…and only 2.5 weeks after he was born! And everyone is happy! What an amazing process. Grandpa might even pull out his newfangled pocket calculator to figure out how many days it took for them to get the photos. Contrast that with our experience nowadays where technology has advanced to the point where I am pretty sure that some of my good friends are actually robots in disguise. 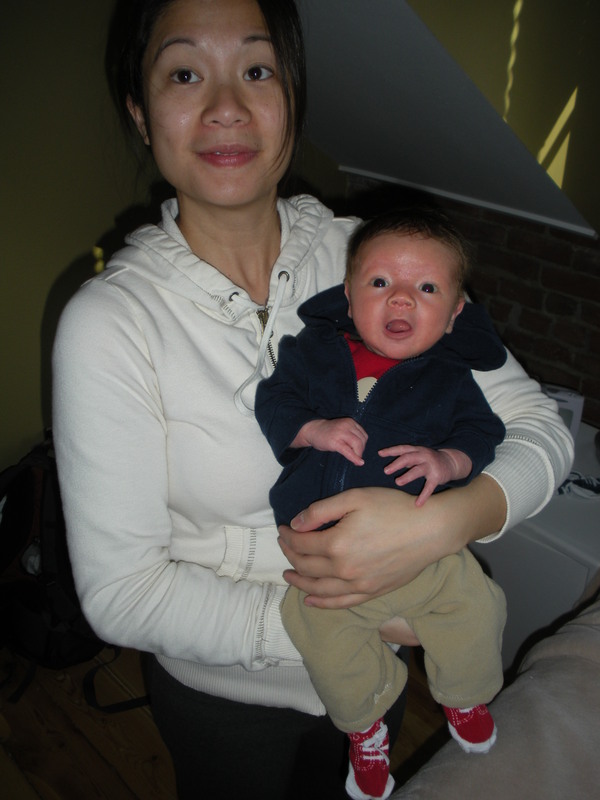 Melanie’s contractions started and within a couple of hours it was time to go to the hospital. We both telecommute and work from home, so all Melanie had to do was walk from her office to mine to tell me we needed to head to the hospital. But even with the pretty well managed lead up, when it’s time, it’s TIME so there is no messing around. I sent a short text “headed to the hospital” to a “labor list” of key family members I had set up on my phone a month earlier. It took about 20 seconds to do and now the key players were notified. At the hospital while Melanie was getting checked out, I pulled out my laptop and connected to the hospital’s free WiFi. I’m now surfing on the information super highway. I opened up a few instant message conversations with some friends. I know, what am I doing IMing when my wife is in labor, but when you are going through really exciting things you want to enjoy that with others. So the chatting was a good way to get support and well wishes along the way. “Hey Melanie, Brady says good luck! !” And I could just check in and respond when it was convenient. I used my digital camera to snap the “perfect” picture every time. When the baby came out, they placed him on Melanie’s stomach and about 30 seconds later I snapped a picture with my cell phone and recorded a 10 second clip of his cry and texted that to the grandparents. Imagine that, the baby was still on Melanie’s stomach – blue and slimy and about 90 seconds old and the grandparents were already looking at a picture of him and listening to his cry. That evening we used Skype to do a video conference with my Mom. She could see him move, talk to him and hear him chirp. 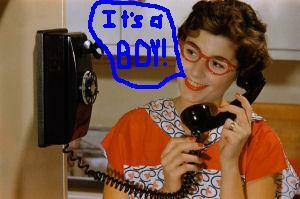 We posted to our blog, Facebook and Twitter news of his birth and pictures. Hundreds of family members, friends and distant friends were now notified and looking at dozens of pictures of the newborn. When I was born, I was lucky if grandpa even knew mom was in labor nevermind that I was born by this stage of the game. We never even bothered to use email because it’s far easier to post something in a known location for anyone and everyone to view rather than try to manage distribution lists (did I forget someone?) or dealing with a barrage of a conversations a mass email might create. The following day I created a UStream account for Maxon where (when we want), we can turn on a live feed via our webcam so anyone we want can view whatever we are doing. We can put the camera over his crib and tell the grandparents they can check in via the web if they would like and see him sleeping. We don’t have to be there to chat, it’s just a one way feed so it’s pretty convenient. I also created a Twitter account for him. Oh sure, he is too young to Tweet, but it’s just a place for us to post daily little (insignificant to most but absolutely loved by grandparents) updates and photos of Maxon. We also continue to video conference several times a week with the grandparents using Skype. So in these two scenarios we see that phone calls have been replaced by video conferencing, live streaming, text updates, video/picture messaging and instant messaging. Letter writing has been replaced by blog posts and emails. Rolls of film and mailing photos has been replaced by digital cameras and photo sharing sites like Kodak Gallery and TwitPic. And even email has started to be replaced by social networking sites like Facebook and Twitter. Information is near instantaneous and in some instances it’s downright live. This can all seem a bit much, but I am sure the grandparents and close friends and family would disagree. We live on the other side of the country as most of the interested parties, so these tools have become somewhat of the glue that holds the extended family together. To us, they are the Sunday night family dinner at grandma’s, grandpa’s first chance to size up his grandson in the hospital or Auntie Rose’s chance to pinch little Maxon’s cheeks. It’s not the same as being here, but it’s a lot better than waiting 2.5 weeks for a few measly, grainy, out of focus photographs. Maxon has a wake up process that usually lasts about an hour. It starts with a few chirps and by the 30 minute mark some mild air boxing begins. 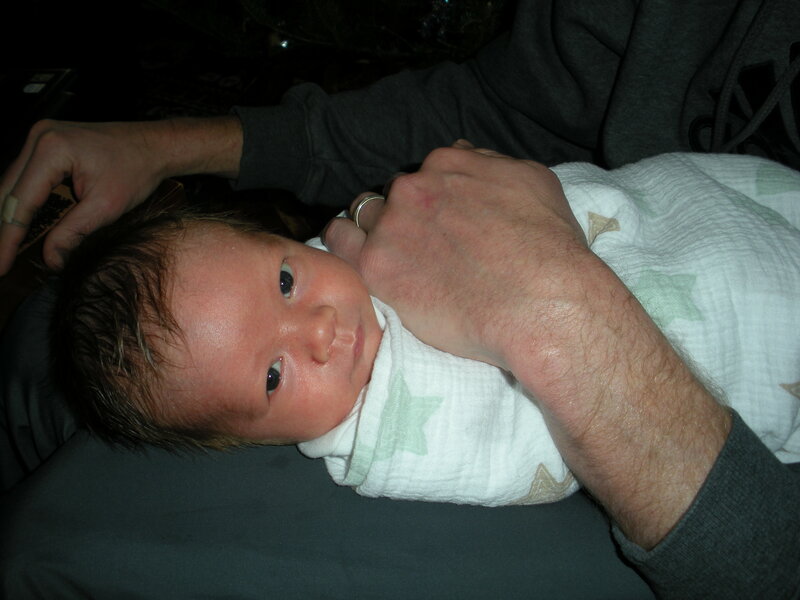 As the one hour mark approaches the legs join the party, and his attempt to escape the swaddle begins in earnest. Have no fear, the video below does not last the full hour but some highlights of the process are assembled for your viewing. Well, technically it’s his second outfit for the day. We had an unfortunate incident in the 4am hour but after a nice little head-to-toe cleaning this morning, we branched out and tried on a new newborn outfit. It’s the new favorite. Thanks Auntie Lindsay! 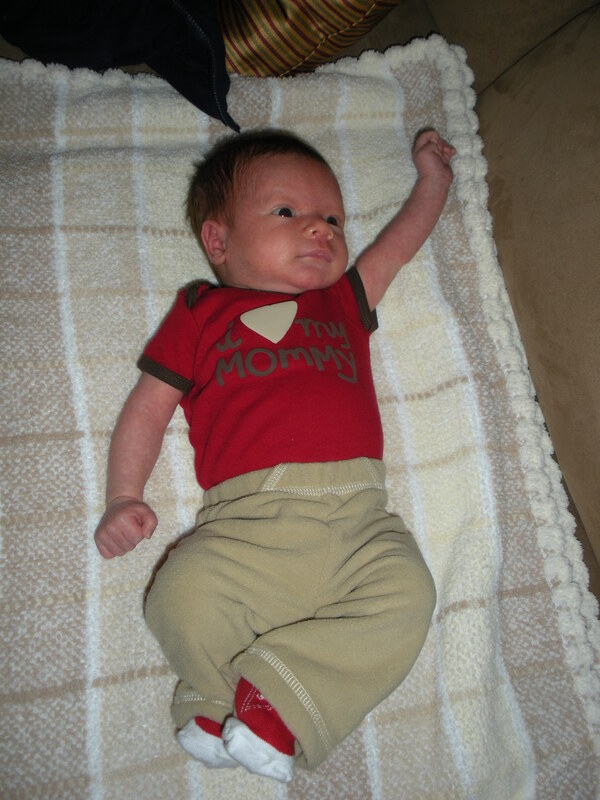 Speaking of the unfortunate incident (3 diapers, 2 feedings, 1 outfit change), dare I say he was a bit proud of it? So excited about it he wanted to stay up and ruminate over it. Really need to sort out that day/night thing in the next few weeks! Today’s outfit. Entirely too big but entirely too cute. 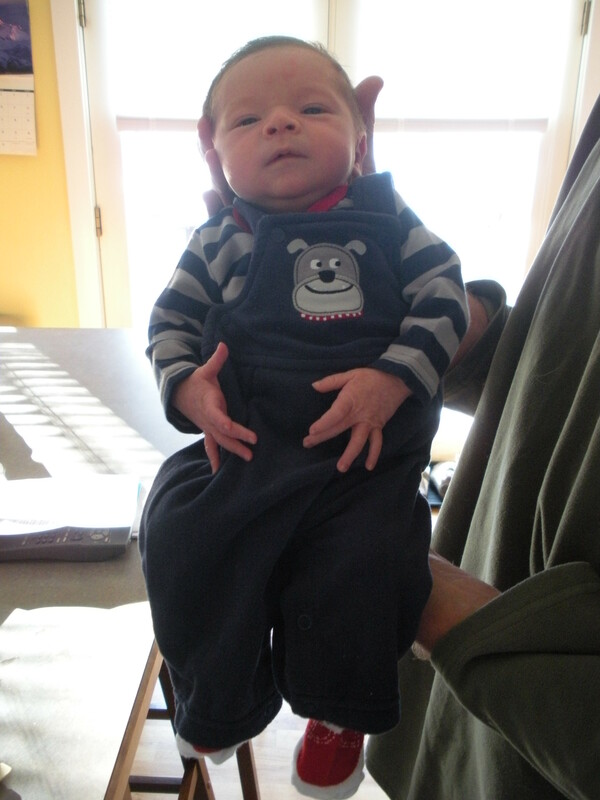 We also attempted size 1 diapers the other day and had to cinch it around his chest. We’re not quite ready yet. 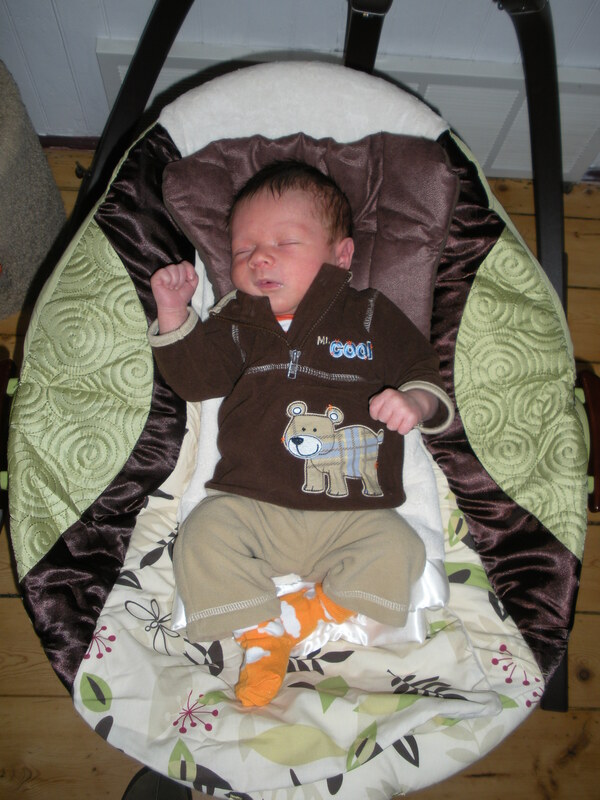 Newborn-size clothing is very subjective. 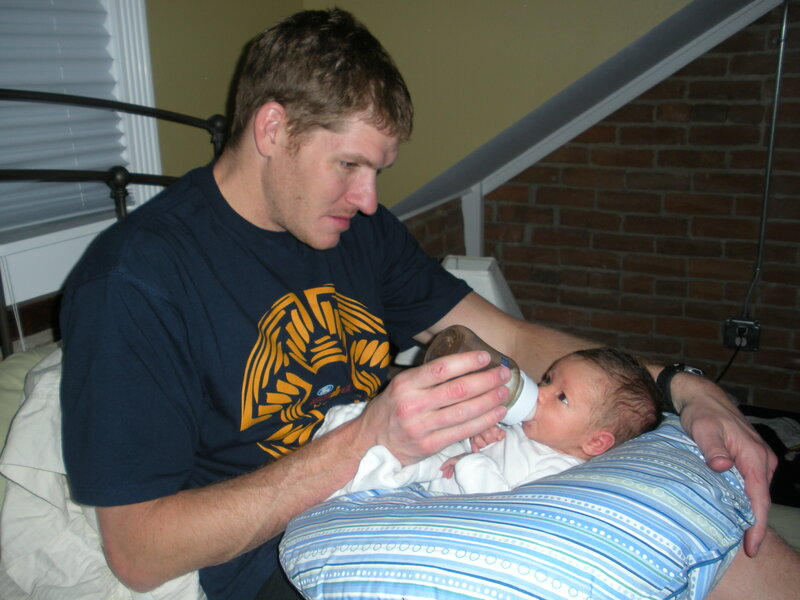 The entire text on the shirt says Daddy's Wingman but the last word is pretty much hanging out by his knees. Something very interesting over there. 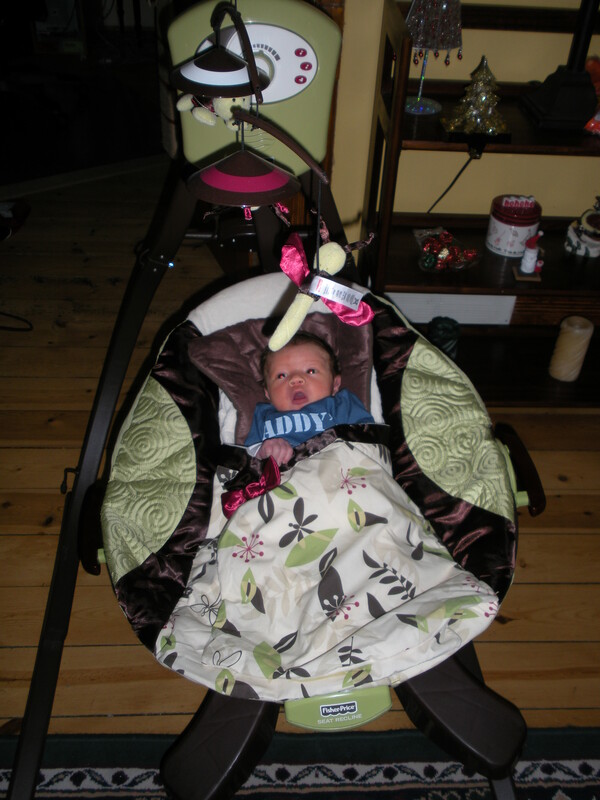 Trying out the swing and not hating it right away.